The two realistically rendered sculptural leaves in the GIFTABLES Garden Leaf Bowl Set will inspire endless serving possibilities. 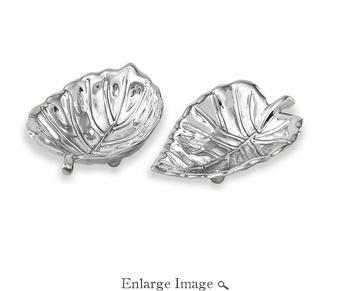 A natural for garden parties, these beautifully detailed silvery leaf bowls in hand-polished metal are perfect for serving your favorite snacks, candies, nuts, and more. From our GIFTABLES Collection featuring handmade and artfully designed Beatriz Ball items at irresistible prices. Packaged in a lovely gift box, they make ideal companions to any of our GARDEN Collection leaf bowls. Handmade of an FDA safe, easy-care, oven and freezer friendly aluminum alloy. Tarnish free.